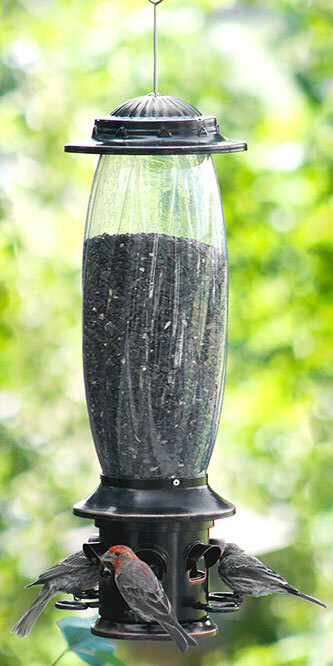 Offer seed to a bevy of songbirds while deterring squirrels with this More Birds Squirrel X-6 Squirrel Proof Bird Feeder. This significant feeder lends a classic look to your backyard, thanks to cylindrical body and copper colored cap and base. The reservoir holds 3 quarts of sunflower seeds, peanut chunks, or mixed seed, and six ports on the metal base allow a few small birds to dine. A perch loop extends from each port, creating resting spots for your feathered friends, and a guard above each opening protects the seed from rain. An internal spring pulls the metal base downward, closing the ports when a squirrel puts its weight on a perch, often preventing them from pilfering seed. Adjust the tension of this spring to deter larger birds as well as squirrels. The metal roof twists and locks closed for added squirrel protection, while its copper and brown tones lend a traditional hint to the unit. A sturdy, metal rod through the center of the reservoir adds stability, and a loop on its end makes it simple to hang this feeder. Keep squirrels frustrated by placing this Squirrel X-6 Squirrel Proof Bird Feeder in your yard.